The financial crisis since 2008 has generated a flood of books about its causes, about its possible remedies, and about both. Unfortunately this awakens the desire to write of pedants and professed experts, just as a red cloth stirs a bull, so that those interested should be on their guard. The book Nach der Krise ist vor der Krise by Armin Steinbach and Philipp Steinberg, issued by the quality publisher Metropolis Verlag, belongs certainly to the top in the category "furnisher of solutions". In addition the financial crisis is analysed in a rigorous manner - but the ensuing crisis of national debts is largely ignored. An asset of the book is the integral manner, in which the problems of the crisis are approached. The first part contains an extensive enumeration of all faults and abuses in the financial sector, including adjacent themes like the rating agencies, financial transaction tax, bonuses and the hedge-funds. In the second part the real economy is studied, among others the national effective demand and the disproportions in the European trade. Moreover there the need for a tax reform is discussed, which is perhaps unexpected but quite useful. Though the authors are fairly young, they prove their expertise. They do not shrink from supporting their arguments by means of graphs and tables. Nonetheless the book is fairly accessible, also for the relative outsider. But yet its excellence has the seamy side that the text is not really exciting. If the theme itself fails to fascinate, then this book will not rouse to enthusiasm. However, those interested will continue reading, and perhaps even appreciate the semi-scientific tone. In contents Nach der Krise ist vor der Krise is a book for left-wing people. That is proven up to the hilt by the suggested remedies and solutions for the crisis. Incidentally, Steinberg is apparently a ghostwriter for Sigmar Gabriel, the chairman of the SPD. That does not mean that left-wing people will agree with all their propositions. For instance, many Dutchmen (especially politicians and labour unions) will dislike the remark, that the huge pension funds with their appetite for profitable investments destabilize the economy. But even if such conclusions are rejected, then the arguments still remain instructive. The title is a parody of a slogan by football coach Sepp Herberger "Nach dem Spiel ist vor dem Spiel". Or, Mannschaft, listen, as soon as this match is finished the next one is coming. And this statement also holds for the financial crisis. This is the first and last analogy, that escapes the writers. Of course Germany gets much attention, but by no means in a positive sense. The authors dislike the economic model, that has been introduced by the Agenda 2010. It results in a low-wage sector, and in a slower growth of the wage level. This is beneficial for the exports, but it also makes Germany vulnerable for the global conjuncture. In addition the succesfull export is an unpleasant burden for the trade partners. The crisis emerged, because the enterprises can shift the negative consequences of their activities on to the society1. Now this can only be prevented by regulations and ordering from the state. In the various chapters it is discussed what can be and had been done. Mentioned are the new rules, which the committee of the Bank for International Settlements in Basel imposes on banking, and the rules of the G20 and of the European Union for securitization (in German Verbriefung). The authors propose that a quality seal is introduced for such speculative products. So the advice is not: just prohibit. If the state guarantee for banks is so excessive that they can not fail, then this causes perverse incentives. The banks are seduced to engage in investment banking, because there the largest profits are possible. But also the losses are mainly due to these activities. According to the authors, when banks wish to invest for themselves, they must satisfy higher demands with respect to the reserves of their own capital. Here the problem arises, that the own investments of banks are difficult to separate from the trade for their costumers. In the Netherlands left-wing people sometimes argue in favour of state owned banks. But in Germany especially these banks have suffered from serious debacles. There the state guarantee is a perverse incentive. 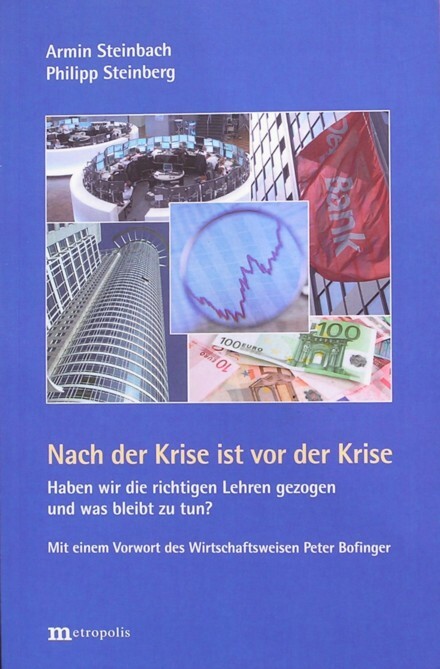 The authors suggest that the state must only own savings-banks. The rating agencies exist thanks to their incomes from buyers. That fosters corruption. The authors prefer a public agency. A general problem is that all supervision is organized at the national level. The supervisors are inclined to compete. However the European Union has improved the coordination of the supervisors. They collaborate in a committee, which develops standards and must warn timely against excesses. But this does not yet curb the addiction of the investors towards gambling. Nowadays gambling is possible by means of "insurances", even with respect to the failure of companies. This is facilitated by the deregulation of the financial markets. However, deregulation is only beneficial in case of rational behaviour, which turns out to be an illusion. Therefore some regulation must be reinstated. The regulation of speculative products can take place by means of standards and inspection agencies. This only works as long as the approach is global, because otherwise the activities will be relocated. At least the excessive flows of capital must be curbed. Therefore the authors advocate the financial transaction tax. That tax can be low (say 0.01%), because the transactions speculate on minimal changes in the prices. It must be introduced at least on the European level. Another problem is the greedy culture of bank managements2. They do not lose their income, even when the bank gets in distress. Thus the common citizens must indeed pay the crisis. The works council could have a say in the reward policy. And the state can reduce bonuses by means of taxes. A special aspect of the book is that the economic slump is partly attributed to a lack of balance in the international trade. The authors want to restrain the German export, and they want to reinforce its national market. This requires an increased equality at the national and international level, which will limit the accumulation of debts. The levelling of the incomes is realized by means of a more progressive tax system. In this respect Germany must make up arrears with regard to the European average. Incidentally the German productivity is high, because the production is capital-intensive. But the part of the yield, that is distributed among the workers, diminishes, because their position on the labour market is weak. Again it is clear that a left-wing block is absent. For although large parts of Europe have introduced a minimum wage, the German left-wing parties have omitted this. Incidentally the same is true for the Scandinavian states. The authors favour a branch-dependent minimum wage. This furnishes food for thought. Do the Netherlands lag behind? Much of the new employment in Germany is "abnormal": parttime contracts with few hours. This employment is not durable3. The unemployment among the less educated Germans is 18%. So training remains crucial. The differences in income must decline, because they cause economic and social damage. Therefore the tax system must become more progressive. This also concerns the property tax, which nowadays hardly exists in Germany. Ecotaxes deserve sympathy, but they have the effect of making themselves superfluous! The authors have an interesting approach for balancing the trade in the European Union. All states must tax their enterprises in the same way. Such a tax functions as an automatic stabilizer, because she reduces the profit during times of prosperity. And the stability- and growth-pact must be extended with a limit on the trade surpluses. The trade balance must not deviate by more than 3% from the GNP. It is an original idea! Why is it not realized yet? The authors prefer balanced state budget (who does not? ), but they want to leave room for an anti-cyclical policy. The notorious 3% of the state deficit must follow the conjuncture. And real profitable state investments must not be added to the debt. And sanctions after a breach of the pact must not ruin a country. It is desirable to found a European monetary fund, which can rapidly supply credits in emergency situations. All these ideas look convincing. Do the authors miss or conceal something? This is the pitfall for such books: they are filled with original finds. But politicians are not crazy, and do have reasons not to choose them. In practice everything has its pros and cons. Also Nach der Krise ist vor der Krise is probably too opinionated and pretentious here and there. Nevertheless your reviewer suspects that the ideas of the authors compare in a favourable manner with other professed experts. That is worth something. Therefore this book about a topical and oppressive theme receives a heartfelt recommendation for everybody with a left-wing heart.